Ionic Liquids (ILs) and Io-Nano Fluids (INFs) are new class of substances which have emerged as “Green” and “Environment friendly” solvents for their use in the industrial applications. Ionic liquids are the mixtures of cations and anions that do not pack well among them and therefore remain liquid at low to moderate temperatures. In the past decade, Ionic Liquids and Io-Nano Fluids have been increasingly used for diverse applications such as CO2 removal in liquid fuels, solar cells, electrochemical devices, heat transfer applications etc. The Physico – Chemical properties of these liquids can be finely tuned by changing cation, anion or by suitably adding nano materials. Thus, novel materials can be formed and can be used for a specific application which cannot be done with the conventional organic solvents. The selection of an appropriate Ionic Liquid or Io-Nano Fluid for a particular application would require a comprehensive database of the fundamental properties like density, viscosity, speed of sound, refractive index, dielectric permittivity, stability, miscibility and polarity over a wide range of temperature, which is not available at present in the literature. 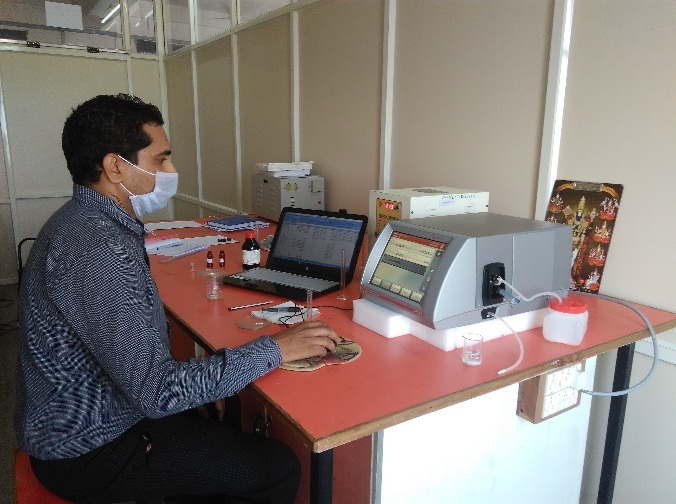 The research lab “Centre for Io-Nano Fluids (CINF)” established by the “Department of Physics” in our institution, with the financial support of “Department of Science and Technology (DST), Govt. of India” focusses its research activity on the development of comprehensive data on the thermodynamic properties of Ionic Liquids and Io-Nano Fluids with the help of experimental and computational studies. Density and speed of sound values will be measured for the binary mixtures of ionic liquids with organic solvents and nano materials over the entire range of mole fraction at different temperatures under atmospheric pressure. Using the basic experimental data - molar volume, isentropic compressibility, molar isentropic compressibility, inter molecular free length, excess molar volume, excess isentropic compressibility, excess molar isentropic compressibility and excess intermolecular free length values will be calculated. The trends of variation of the parameters determined will be interpreted in light of the molecular interactions occurring in the systems. Computational calculations will be performed to predict the energies, molecular structures, vibrational frequencies and other molecular properties derived from the basic quantities, using the laws of quantum mechanics. Identification of the best Io-Nano Fluid for heat transfer (coolant) mechanism.